Before and after pictures of Tetrapylon. 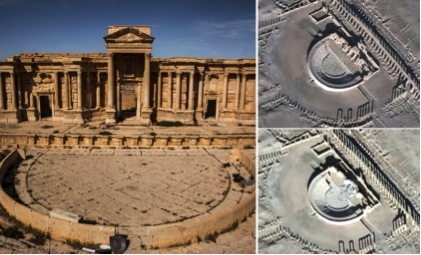 Before and after pictures of the ancient theater. 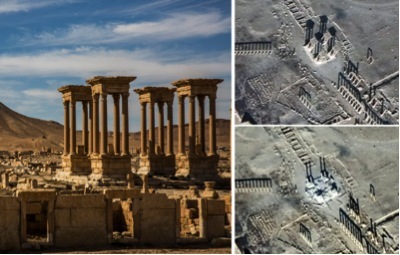 Ever since the Islamic state took control over Palmyra in May of 2015, their cultural sites and soldiers were targeted and destroyed, one after the other. Artifacts that were over 1,800 years old were destroyed, and the city was turned to rubble. Irina Bokova, Unesco’s director general had a extremely accurate statement for all the attacks, saying how it “shows how extremists are terrified by history and culture.” They do not take well when they are out of control and have to follow any history or cultural rules. Ancient artifacts are being destroyed left and right and sadly, nothing seems to be stopping them now.